Brakes are a perfect example of how a small part can have a big effect on your vehicle’s overall health. If you notice any sticking, shaking, or squeaking when you brake, it’s time to visit a mechanic. At Glenn’s Auto Repair, we spend much needed time on your brakes, so you don’t overspend much needed money later. Brakes are only a small part of what makes your car run properly. They have little to do with moving your vehicle, but everything to do with stopping it safely. Brakes are a sensitive part of your vehicle, because you rely on them to do so much. In the rain, ice, and snow, brakes might strain to stop as extra lubrication prevents friction from taking its course. As they begin to wear down, you will find yourself pressing harder on the brakes to slow and stop your vehicle. The brakes on your vehicle work by halting the flow of kinetic energy by way of friction. Through friction, all that energy is turned into heat when your brake pedal pushes a piston via a lever into a hydraulic fluid filled cylinder. Kinetic energy is powerful, and your vehicle can reach high speeds, taking more friction to slow and stop it in motion. Fortunately, your brakes are designed to take up to 950 degrees Fahrenheit in friction heat to keep you and your family safe and sound. When you think about it that way, it suddenly seems more important than ever to keep your brakes in working order. 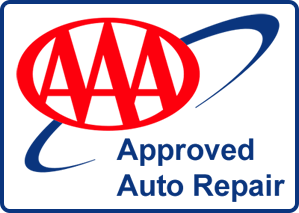 At Glenn’s Auto Repair, we know how important safety is to our clients. Your safety and comfort on the road is our top priority, which is why you can count on us to deliver outstanding brake repair service every time. Our team of experienced mechanics knows all the ins and outs of disc and drum brakes, and can help you to better understand why your brakes are failing, and what can be done to make your vehicle drivable again. Most vehicles have a mix of drum brakes and disc brakes, while some modern vehicles use only disc brakes. It’s very rare to see a vehicle now with only drum brakes, although some older models may still sport them. Cars with dual brake types usually wear drum brakes on the rear and disk brakes on the front. Disc brakes are called this because of the round disk which makes up the brake. It also includes a pad and a caliper. When your foot hits the brake pedal, hydraulic fluid is released, forcing the caliper to push the pad against the disc, this is what causes the friction to build, and your vehicle to stop. A drum brake, on the other hand, still uses friction to convert kinetic energy into heat, but it does so with a set of pads which press out onto the brake drum. The brake drum resembles a cylinder, which rotates. Brakes, like your engine, make it obvious when there is a problem. You will likely notice odd sounds or sensations when you try to brake, letting you know there is a problem. Listen for groaning, growling, or scraping noises, and take heed if your car begins to shake when you brake, or pull to one side. As brake pads deteriorate, your brakes will become less responsive, you will have to apply more force, or your stopping time with decrease. It’s important to take note of this change in stopping distance so that you don’t travel too closely behind another vehicle when your brakes aren’t in tip top shape. When you bring your vehicle to an experienced mechanic, such as our team here at Glenn’s Auto Repair, there are usually a few different options to fix an unresponsive or misbehaving brake. Depending on the severity of the damage to your brakes, you may only need to replace the pads. Sometimes, the entire brake disc or caliper will need to be replaced, but this is rare. If you take good care of your brakes, change the pads regularly, and have them maintained by a mechanic, you will spend less on brake repair, and spend more time behind the wheel. For more information on brake repair, and other services offered by Glenn’s Auto Repair, contact us today. Our team of professional mechanics are always happy to meet with new and existing clients at your convenience. Keeping our clients safe and comfortable on the road is our number one concern, so if you’re experiencing trouble with your brakes, stop by and see us.